The Sierra Club's "2018 Ready for 100 Case Study Report" outlines how 10 US cities have made ambitious commitments to be powered with 100% clean energy. These cities are embracing renewable energy options like wind and solar to show the progress and impact that cities can make to lead climate action globally and locally. More than 80 cities in the US have now established policies to move away from dirty fuels and repower their communities with 100% clean, renewable energy sources. As a direct consequence, fossil fuels are being pushed out and expectations are rising for electric utilities, states, and energy generators to go all-in on clean and renewable power. As Jodie Van Horn, director of the Sierra Club's "Ready For 100" campaign, observed leaders from around the world gather in San Francisco earlier this month for the Global Climate Action Summit, she acknowledged how local 100% clean energy leadership is having a global impact. "Cities are taking meaningful steps to realize a vision for healthy, vibrant, and more equitable communities powered with 100% clean energy," Van Horn said. "A transition to 100% clean energy is within reach, and together we can create a new energy economy that transforms not only how we power our country but also who has power to decide what's best for our communities." Cities of all sorts are moving with common purpose to protect public health, create jobs, and reduce energy burdens for local residents by making a just transition to clean energy. Sierra Club's "2018 Ready for 100 Case Study Report" calls upon each of us in our own communities to shape what a true 100% clean energy economy looks like and to ensure that we get there in a way that empowers and benefits everyone – particularly those hit first and worst by fossil fuel pollution. "Together, we can create a new energy economy that transforms not only how we power our country but also who has power to decide what's best for our communities," the report's authors advocate. 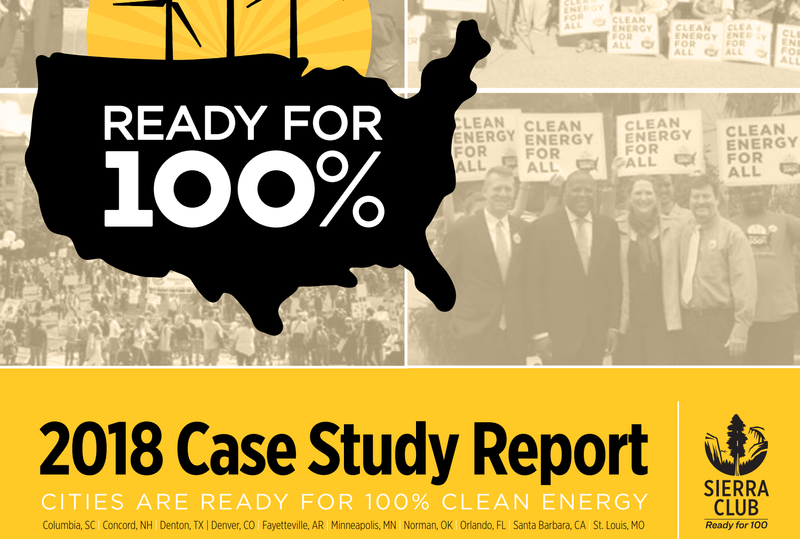 This is the 3rd annual case studies report from "Ready For 100," a Sierra Club campaign launched in 2016 that works in cities across the US to accelerate a just and equitable transition to 100% clean energy. Here are some highlights from the 2018 "Ready for 100" Top 10 US cities list. In 2015, record downpours caused all 3 of the rivers that flow through Columbia to overflow, causing severe flooding, washing out hundreds of roads, destroying 45 dams, causing billions of dollars in damage, and costing 19 people their lives. In response, Mayor Steve Benjamin pushed to acknowledge and address the growing threat of climate disruption by supporting clean energy legislation at state and local levels. Columbia adopted its clean energy resolution in June 2017, becoming the first city in South Carolina to commit to transition to 100% clean energy. Columbia is taking important steps to meet this goal, including a thorough energy efficiency audit, planning a solar-powered wastewater facility, and transitioning municipal operations to 100% renewable energy. Clean energy efforts will run parallel to sustainable water management and wastewater infrastructure improvements that are designed to guard against future flooding. state policymakers about how best to achieve the adopted renewable energy goals. energy. Although the city is currently locked into ownership of a new gas plant, a study recommended using the plant primarily as a financial hedge against spikes in local energy prices and not to meet electricity needs in the city. Denton would still purchase enough wind and solar energy to meet all the community's electricity demands, and the gas units would run 10% to 15% of the time to earn money on the Texas energy market. The Denton City Council unanimously approved a contract for a 100-megawatt solar project called Bluebell II to augment its existing contract with 30-megawatt Bluebell I. With more resources expected to come online in the next 2 to 3 years and the cost of wind and solar dropping steadily, Denton is surging to the forefront as a municipal clean energy leader. In July 2018, Denver joined 9 other Colorado communities in making the commitment to transition to 100% clean, renewable electricity. Colorado's capital took bold strides toward ensuring a more environmentally responsible future in 2015, when the city presented a first-of-its-kind Climate Action Plan that pledged to reduce carbon emissions by 80% by the year 2050. The new 80 x 50 Climate Action Plan goes beyond clean power: It incorporates strategies for land use and development, home and business efficiency upgrades, and mass transit planning to meet the city's 80% carbon reduction goal. The plan also includes provisions for a community solar program – a net-zero building code for new construction by 2035 – and a fleet of 100% electric light-duty vehicles, taxis, and car shares by 2050. A varied coalition of more than 50 nonprofits and businesses is standing behind the clean energy plans. Supporters include the Working Families Party, the Colorado Latino Forum, the Denver NAACP, the Democratic Party, and the Denver Labor Federation. University of Arkansas Partnership Helps Town Get Recognized as a "Best Place to Live"
Fayetteville, Arkansas, has set a goal of 100% clean energy in city government operations by 2030, and city wide by 2050. The commitment is part of the city's comprehensive Energy Action Plan, which lays out ambitious goals and strategies for energy efficient transportation, buildings, waste management, carbon emissions reduction, and more. As Fayetteville continues to explore clean energy solutions with its existing utility companies, the city is simultaneously looking at solar investments and other energy efficient upgrades for municipal buildings. It is also launching a bike-share program, strategizing to increase urban tree planting, and working out how to use funds from the Volkswagen settlement to invest in electric-vehicle charging stations for its downtown area. Despite its reputation for long, frigid winters, Minneapolis ranks high for solar capacity and was named a "Solar Builder" in a report released by citizen advocacy group Environment America. The state's community solar program is, indeed, setting the standard for solar energy, both in capacity and legislation. The community solar program has plans in place to produce 400 megawatts of clean energy – that's 10× the amount produced so far in the entire US from similar programs. In addition, Minnesota's solar energy doesn't come with a cap on development. As a result, 92% of residential utility customers are saving with a community solar subscription. engagement and equity-based solutions. By making it clear that clean energy initiatives must consider everyone in the community, Minneapolis sets an important precedent that may influence other Midwestern neighbors to follow suit. After a year-long campaign, a volunteer-led team persuaded the city of Norman, Oklahoma, to commit to 100% clean, renewable energy across all sectors, including heat and transportation, by 2050. A unanimous vote by the City Council in May 2018 made Norman the first city in Oklahoma to adopt such a goal. Council members weighed in on the numerous environmental benefits, job opportunities, and economic advantages of renewable energy, and the resolution garnered cross-community support from environmental, commercial, educational, and faith groups. The city of Norman is currently working with its two utilities to determine its best options for moving to clean energy. The University of Oklahoma is already using 100% renewable energy through the purchase of renewable energy credits. Norman is exploring a solar program for its public schools and looking at updating its legislation to make the adoption of solar energy easier. Through a 2017 pilot program, Norman became the first city in Oklahoma to incentivize energy-efficient home building. Other sustainability efforts include plans to promote electric vehicles and greener building practices. Orlando is working closely with its municipal utility to decarbonize its energy offerings and rapidly expand the availability of solar energy, while at the same time creating programs that reduce, defray, or even eliminate the upfront costs for end consumers. Two of the solar support programs now available include Community Solar, which allows residents and businesses to choose the source of their energy, with up to 100% coming from renewable sources, and Collective Solar, a cooperative model that creates economies of scale, enabling homeowners to opt into rooftop solar at significantly reduced costs. Orlando has also implemented a PACE program that will provide $500 million in clean energy financing to residents and businesses. The Santa Barbara City Council's #ReadyFor100 resolution set an interim milestone of 50% clean energy in municipal buildings and operations by 2020, followed by a 100% city-wide deadline of 2030. Since committing to these goals, Santa Barbara has been working on a zero-net energy report for city facilities and is creating a strategic energy plan to find the most economical pathways. In July 2018, the city council voted unanimously to form a new Community Choice Energy program in partnership with Santa Barbara County and the neighboring cities of Goleta and Carpinteria. Santa Barbara expects to launch its CCA energy program in 2021, which will immediately bump its renewable energy mix from its current 32 – 34% range up to 50%. The St. Louis Board of Alderman unanimously approved a commitment to transition to 100% clean renewable energy by 2035. Its supporters have a long-term vision for St. Louis, one driven by green job creation, cleaner air, and better quality of life for all residents. The city has set a deadline to develop its clean energy transition plan by December 2018 and has assembled a diverse and inclusive stakeholder committee to gather input and expertise from every corner of the community. A Renewable Choice Program enables St. Louis (and any other cities in its service area, along with large industrial and commercial consumers) to receive up to 100% of their electricity from renewable sources. This program is the first of its kind in the state and sends a powerful signal that, even in communities with long ties to coal, the benefits of clean energy are too great to ignore. The 10 cities profiled in this report demonstrate that there are many ways municipalities are beginning to transition to 100% clean energy. While the approach and specific steps may differ from city to city, the report showcases some emerging themes across the landscape. Through policies and regulations, cities are creating pathways to support the rapid development of renewable energy in their communities. This article was written by Carolyn Fortuna from CleanTechnica and was legally licensed through the NewsCred publisher network. Please direct all licensing questions to legal@newscred.com. Can Batteries Make My Home Energy Independent?